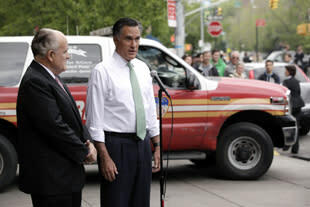 NEW YORK--Mitt Romney marked the one-year anniversary of Osama bin Laden's death by joining former New York City Mayor Rudy Giuliani at a Manhattan firehouse that served as the city's first response center in the aftermath of the 9/11 attacks. But the photo op was hijacked by a female heckler, who loudly accused Romney of being a "racist" for his stance on immigration reform. "Mitt Romney is a racist!" she repeatedly screamed, drowning out Romney's comments and those made by Giuliani as well. "Racist! Racist!" Her screams appeared to have prompted Romney aides to cut the presumptive Republican nominee's talk short. While Romney did not acknowledge the protester, the candidate walked away from the microphone after just five minutes and moved toward his waiting SUV. When Giuliani did not follow, Romney awkwardly returned to the microphone to thank the former mayor for joining him at the event. As the protester continued to assail Romney—bellowing expletives at the GOP candidate, including "F*** you, Mitt Romney! "—he exited the scene again, this time for good. The event was supposed to burnish Romney's foreign policy credentials as the nation marks the anniversary of bin Laden's death. Speaking to reporters, Romney offered his praise for all the people involved in the raid—including President Barack Obama. "This is the anniversary of the day Osama bin Laden was taken out, and we respect and admire the many people who were a part of that, from the president who authorized that to the intelligence community who worked on it for so many years to identify where he was, and, of course, to the members of our armed services," Romney said. He insisted he would have done "the same" as Obama by ordering the raid that led to bin Laden's death, claiming that suggestions to the contrary by Obama aides were "an inappropriate use of an event that had brought America together." Romney was asked about comments he made in 2007 during his first run for the White House, in which he attacked Obama for suggesting he would go after "high value targets" within Pakistan. At the time, he said it was not worth moving "heaven and earth spending billions of dollars to catch just one person." Romney insisted he was offering the same critique as Vice President Joe Biden did during his bid for the 2008 Democratic presidential nomination—suggesting Obama was "naive" by announcing he would go into Pakistan with or without the country's approval. "I said that very clearly in the response that I made, but that I thought—and many people believed as I did—that it was naive on the part of the president at that time, the candidate, to say he would go into Pakistan," Romney said. "It was a, if you will, fragile and flammable time in Pakistan, and I thought it was a mistake of him as a candidate for the presidency of the United States to announce he go in." Giuliani defended Romney against Democratic assertions that he wouldn't have taken the same action against bin Laden as Obama, and, like Romney, accused the president of politicizing the event. "Using 9/11 as a source of negative campaigning was a mistake," the ex-mayor said. • Sen. Kelly Ayotte campaigns with Mitt Romney—a tryout for VP?